One of the most interesting places I visited in Barcelona was La Boqueria. The displays of fruits and vegetables were very appealing and many were in layers. I had a difficult time deciding what to buy. 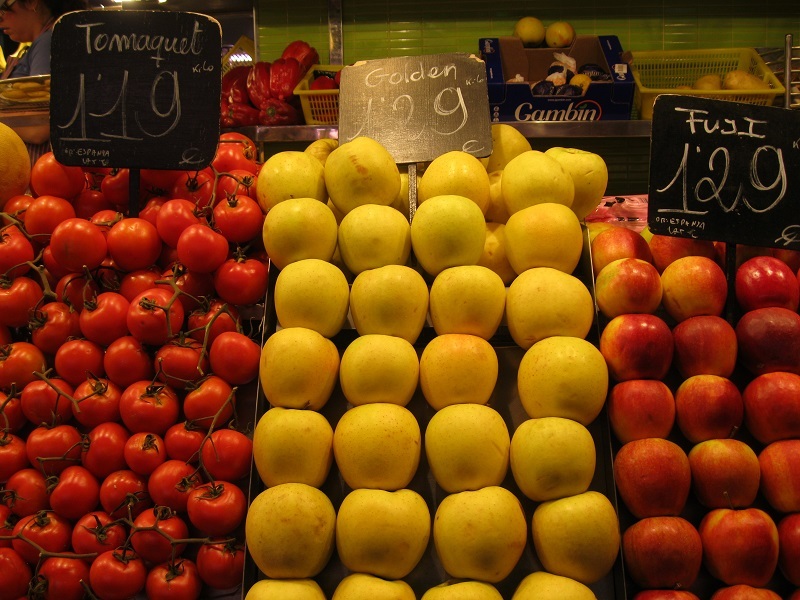 This entry was posted in Barcelona, Spain, Travel and tagged fruit, La Boqueria, vegetables. Bookmark the permalink. Lovely pictures! I love how colorful everything is in the Boqueria. Thank you Jessica – I liked the bright colors too! Fruit! Colourful and refreshing layers. I agree – the displays were really charming! It was interesting to see all the layers! Love it!!! I wish I could reach into the photos and help myself. I agree. Go there every time I’m in Barca. I’d like to go back there again – it’s such a great place. The colors are really appealing! Lovely colourful images that fit the layers photo challenge perfectly. Thanks – it’s so much fun looking for the right pictures! Barcelona is a wonderful place isn’t it? I can understand why – it’s one of my favorite places too! :) I went there at least once a day when I was there. You must have good memories of going there! It was :) good thing I was walking about 7 hours a day. Fresh, colorful, and delicious layers :) Great choice, Meg! Thanks Lorna – I think that visiting a market is a really interesting and fun experience! Beautiful, Meg. So colorful, and perfect for the theme. Eye candy! That’s a great way of putting it Naomi – the displays were absolutely delightful! Markets can always be counted on for amazing photo ops like these! That’s so true Patricia – markets are wonderful places! What a great idea to think of recipes as a way to use all those lovely fruits and vegetables! They all look so delicious….especially the cherries!! I really liked the cherries too – they looked so appealing! You *know* what a big fan I am of this particular form of layers!!! Beautiful shots. Thank you Kathryn – I think that it’s a most delightful type of layer! These layers are live! Great colorful interpretation Meg! Thanks, I thought the colors were extra cheery! Thanks for the RTs, Meg- it’s much appreciated. What a find! These are PERFECT layers!